Unfortunately there seem to be fewer species orchids in flower at this time of year than any other. As in the preceding article, those species that I grow in my heated glasshouse (minimum temperature of 12°C) are marked with an asterisk. Laelia pumila and Rossioglossum grande are the only species mentioned that I have grown in a shade house for several years, although Oncidium uniflorum has survived one winter under these conditions. Barkeria scandens* and Barkeria skinneri* are two Mexican species that I highly recommend. Barkerias have an undeserved reputation of being difficult to maintain in cultivation but only by those who insist in trying to grow them in pots. When mounted on cork or pieces of rough bark and allowed a long resting period during winter, they grow well and flower every year in my heated glasshouse. Because of their winter dormancy, I feel sure that they could be grown under shade-house conditions, provided that they were kept dry during winter. 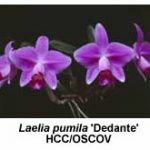 They are closely related to the reed-stem epidendrums and resemble smaller versions of those plants quite closely. As soon as the new growths make an appearance in October I try to dip my mounted plants in a weak solution of liquid fertiliser at least once every sunny day until the active (green) root tips seal over in late autumn. The terminal inflorescences begin to develop in mid-summer and by late April bear about 15 magenta-red flowers, which last in good condition for several months if kept dry. 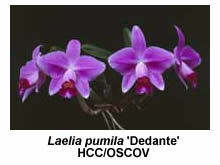 Laelia pumila (syn. Sophronitis pumila) has the smallest plant of all the Brazilian laelias but its flowers are quite large (about 100 mm across). My plants grow happily suspended beside the Australian native dendrobiums. They are re-potted in pine bark in small pots every two years. The inflorescences of well-grown plants bear two attractive pink flowers every April. If grown in the heated glasshouse, they flower much earlier, usually in November. 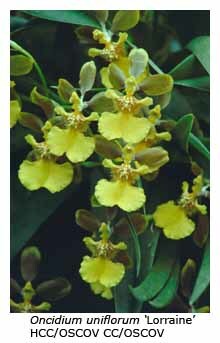 Oncidium longipes* and Oncidium uniflorum* are often confused, because their flowers are quite similar. 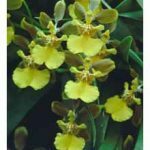 However, the inflorescences of Oncidium longipes usually carry four or five flowers, whereas those of Oncidium uniflorum bear only two (not one, despite its name). 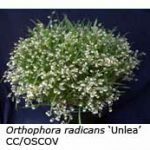 Also, O. longipes flowers about a month earlier than O. uniflorum. The sepals and petals of both species are yellow with greenish brown bars; the lip is yellow with white calli. The plants branch readily, yielding attractive specimen plants within ten years. 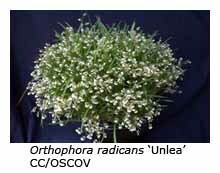 Ornithophora radicans* is a miniature, monotypic species from Brazil that may be accommodated either on a mount or in a pot. It should be kept moist all year. The inflorescences carry up to ten small flowers with yellowish green petals and sepals and a white labellum. It needs to be grown into a specimen plant before it makes an impact. Pleurothallis sclerophylla* is one of the larger growing species in the genus Pleurothallis. As its specific name implies, it has thick, tough leaves. Each recently matured growth produces a long inflorescence bearing many spidery, yellow-green flowers. 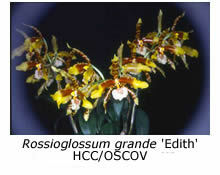 Rossioglossum grande is one of six species in the genus. All grow in Central America at moderate to high altitudes, and can therefore be grown under shade-house conditions in Melbourne. 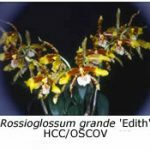 Rossioglossum grande needs an open mix with free drainage and must be provided with good light. Plants should be watered very sparingly during winter, and allowed a brief resting period after the pseudo-bulbs have matured. Inflorescences carry up to eight waxy, long-lasting flowers (100-150 mm across). The petals are bright yellow at their tips and chestnut brown at the base, while the paler sepals have transverse chestnut brown bars.